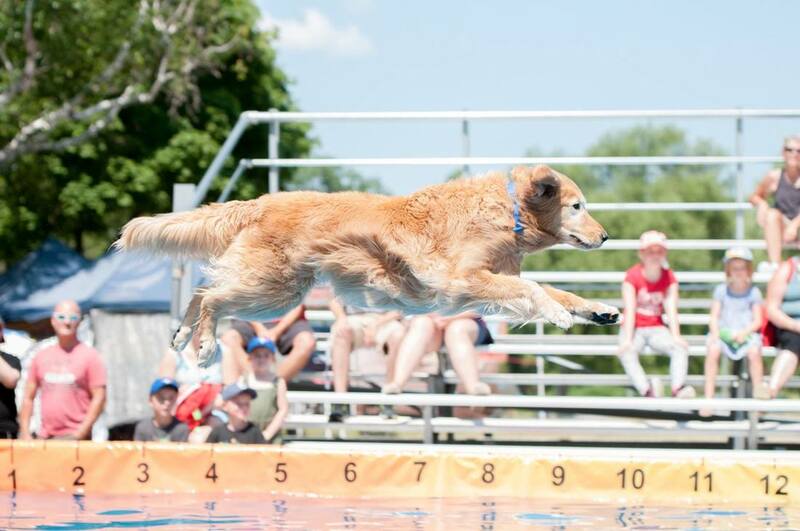 JUMP is long distance jumping, and the main feature of Canine Watersports Canada events. Dogs run down our 36' dock and jump into our 45' pool of water chasing their toy. Scores are determined by our judges who measure the jump from the end of the dock to where the base of the dog’s tail enters the water. Each competitor gets two jumps, with the bigger of the two jumps counting as their score. The dog’s best score from the 2 jumps is placed into one of our 5 divisions according to the distance jumped. The top 5 dogs in each division will qualify to compete in the FINALS at the end of the event. NOVICE JUMP DOG: 0' - 9'.11"
JUNIOR JUMP DOG: 10' - 12' 11"
TOP JUNIOR JUMP DOG: 13' - 14'.11"
SENIOR DOG: 15' - 16'.11"
TOP SENIOR JUMP DOG: 17' - 18'.11"
MASTER JUMP DOG: 19' - 22'.11"
TOSS is similar to Jump, however, the Dog must catch the object thrown by the handler. Each competitor gets two tries which only count if the object is caught. NEW SCORING IN 2019; there are now 2 parts to the scoring in Toss. Part 1 – the “Catch” score, PLUS, part 2 - the “Landing” score. You will get 2 attempts, if your dog makes successful catches both times, the catch score and the landing score are added together for a final score. Please note: You must throw the object in order for it to count towards a score. If the CWC judges consider it a “hand-off”, you will get no score. In the event of a tie, both dogs will jump again and the dog with the highest score wins. Not only it is an added challenge for dog to catch the thrown object while in mid- air, but it also requires skill and strategy from the handler. GRAB is a combined height and distance discipline, which consists of 3 divisions. This discipline is not about height! LURE is a timed swimming race that is similar to lure coursing in the water. The dog starts 5’ from the pool end of the dock and the dogs 2 front feet must remain on the 5' line until they jump (pulling your dog back or slingshot your dog will lead to automatic disqualification). A second handler can stand at the other end of the pool, near the finish line to encourage the dog to swim faster. A "lure" bumper can be thrown into the water in front of the dog and will be pulled to the 35’ finish line by a Canine Watersports Canada staff member or volunteer standing at the other end of the pool, the handler can throw a toy past the 35' mark or the handler can stand at the end of the pool and LURE the dog with his favorite toy. The stopwatch is started when the dog leaves the dock and stops when the dogs nose crosses the 35' mark. Each dog will have 2 tries to achieve their fastest time. TRY IT is available at most events for a small fee and is open to all dogs who want to try dock jumping during open dock time but are not yet competing. During this time dogs are not judged or scored. ​PLEASE NOTE that all TRY-IT jumps also do not count toward Finals or Titles. Legend Dog division was created for those dogs over 8 years old who want to compete against dogs of similar age. Please note that Legend Dog is it's own division, and is NOT broken down into divisions. You must choose to compete as a Legend when you register (you cannot compete in both). ​Junior Handler division was created to highlight young handlers. This division is also its own division, and is not broken down into divisions. You must choose to compete as a Junior Handler when registering, however we understand that some junior handlers do not have their own dog, so, the dog may compete in regular disciplines with the regular handler, as well as with a junior handler.